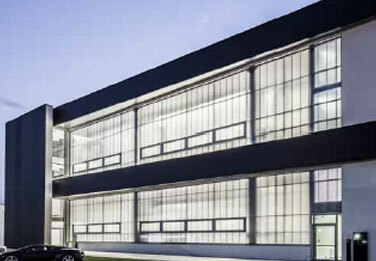 To achieve the goal, architect created Class A building with straight lines, highlighted by the use of corporate colours in opposition to one another,”absolute white and black”, and reiterated it on several innovative buffering materials. Coating and claddings have played a vital role in achieving the maximum energy class. 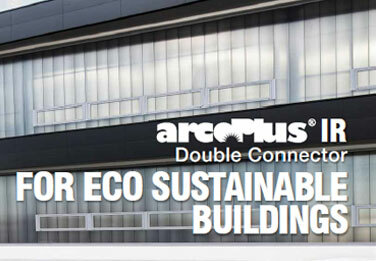 The use of​"arcoPlus Double Connector "has made it possible to considerably decrease the heat loss of the transparent facades. Consider that , while a high performance infix is able to reach a thermal transmittance upto 1.2 W/m2K, the polycarbonate double used on this project reached the value of 0.62 W/m2K. arcoPlus Double Connector was manufactured with a unique IR filter which can restrict the passage of infrared radiation which causes the heating in the interior of a workplace. The system has ensured high energy performance and reduced thermal conduction between outside and the inside of the building eliminating thermal bridges. The function of IR is to absorb infrared component of solar radiation (780 – 1400nm), blocking solar radiation responsible the greenhouse effect, while permitting the passage of the visible component.